Most of you will know by now that Gord Fuller suffered a major heart attack last Sunday morning shortly after helping load tables from our gung haggis fat choy event the previous evening. It goes without saying that all our thoughts and prayers go out to Gord and we wish him a full and speedy recovery. Finish your creative projects with community this Jan, Feb and Mar! 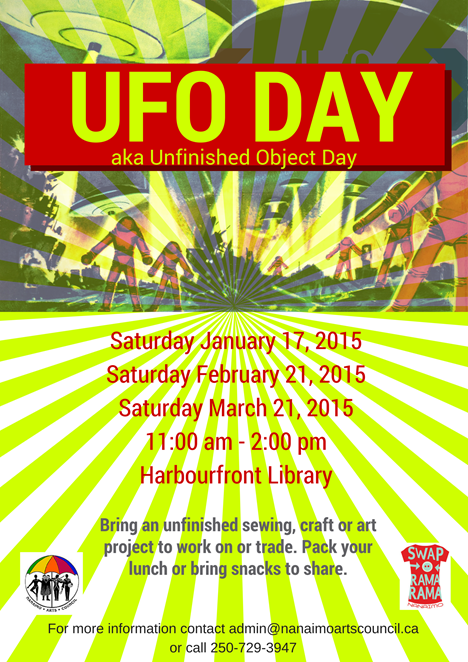 Saturday, January 17 from 10:00 am to 2:00 pm at the Harbourfront Library the Nanaimo Arts Council and Swap-o-Rama-Rama will be hosting a free “UnFinished Objects (UFO) Day”. Bring anything portable that you want to finish. Sewing, crafting, painting, drawing, if you can carry it you can bring it. Bring your supplies and tools as well. There will be a sink, electrical outlets, tables and chairs available. If you can bring any of the following that you would be willing for others to use let the Nanaimo Arts Council know: an iron, ironing board and/or full length mirror. Feel free to bring snacks to be eaten with fingers and there will be tea and coffee available. You can come and work on your own; however, UFOs are usually unfinished for a reason. Do you need some kind of help or motivation to get going again? If so UFO Day is for you. Participants can help and motivate each other. Another way to get rid of a UFO is to pass it forward and there will also be a UFO Swap Table. Come celebrate Chinese New Year & Robbie Burns Day with SECA! This is the second of this now annual event which will be full of traditional (and non-traditional) festivities such as the procession of the Haggis and Fish, Scottish Country Dancers (of all ages and do join in), and dinner and dessert. Dinner will include a buffet of beef-on-a-bun sandwiches, veggie burgers, and three kinds of salad – green, Caesar, and bean. Bring your loot bags as there will be a 50/50 draw, as well as exciting and tempting silent auction items which help us to raise money for our yearly events such as the South End Heritage Miner’s Day Picnic and insurance. See you there! LOCATION: Nanaimo Entertainment Center 46 Nicol St.
Tickets available at Sandra’s Head to Toe Salon – 721 Haliburton St.